Mahlangu’s inventiveness as a printmaker has been commented on by Philippa Hobbs and Elizabeth Rankin in their joint publications on South African Printmaking in 1997 and 2003,1 and he received special mention from the American art critic Clement Greenberg when he visited South Africa in 1975. A student at Rorke’s Drift with the late Thami Mnyele and Paul Sibisi (qv. ), Mahlangu was initially inspired by the late Cyprian Shilakoe’s (qv.) pioneering etching initiatives. He was also exposed to printmakers Vuminkosi Zulu (qv.) with whom he later shared his graphic studio, and Eric Mbatha (qv. ), John Muafangejo (qv. ), and Hugh Nolutshungu, all of whom were resident artists at Rorke’s Drift when Mahlangu was a student. In 1980 Mahlangu was invited to be a guest lecturer at the Natal Technikon, and in 1982 he was employed as a graphic artist by the SABC. Mahlangu’s A sacrament for the last supper (plate 213) is an interesting companion piece for Vuminkosi Zulu’s etching of the same subject (plate 205). Both are intensely animated images, but whereas Zulu captures the pandemonium surrounding Christ’s announcement of his betrayal, Mahlangu’s image centres on the despair of the disciples as well as their devotion to an Africanised Christ. The representation of Christ in a manner not far removed from the popular figure of the demagogic preacher, introduces into the work what Hobbs & Rankin (2003) have noted in his work as ‘gentle humour’ and De Jager (1992) previously described as a ‘humorous undertone’. An interest in surface pattern, tonal contrast and gesture, add excitement and drama to the image. Boys II (plate 212) is an image of inadequately-clad adolescents attempting to warm themselves whilst exposed to the elements. Their furtive looks over their shoulders indicate fear, and their owl-like eyes serve to suggest that they have witnessed and experienced things beyond those to which a child should be exposed. The influence of Cyprian Shilakoe (qv.) can be detected in this work in both the stylistic treatment of the eyes and the atmospheric, ‘starry’ background. 1997: Printmaking in a transforming South Africa. David Phillip: Cape Town and 2003: Rorke’s Drift: Empowering Prints. Double Storey: Cape Town. Born 1951, Brakpan. Training c.1972–75: Evangelical Lutheran Centre, Rorke’s Drift. 1975: Bill Ainslie Studios, Johannesburg. Exhibitions 1973–1988: Participation in several group Exhibitions in South Africa, including Art South Africa Today, Durban Art Museum (1973, 1975); Tributaries, Africana Museum in Progress, Johannesburg (1985); and The Neglected Tradition, Johannesburg Art Gallery (1988). 1976–1979: Participation in group Exhibitions in the USA, West Germany, Israel and Portugal including Black South Africa: Contemporary Graphics, Brooklyn Museum, USA (1976). 1979: Solo Exhibitions at Lidchi Gallery, Johannesburg; and African Art Centre, Durban Collections Absa Bank, Durban Art Museum; Killie Campbell Collection, Durban; Rand Realty Collection; United Nations, New York; De Beers Centenary Art Gallery, University of Fort Hare; University of South Africa, Pretoria; University of the Witswatersrand, Johannesburg. 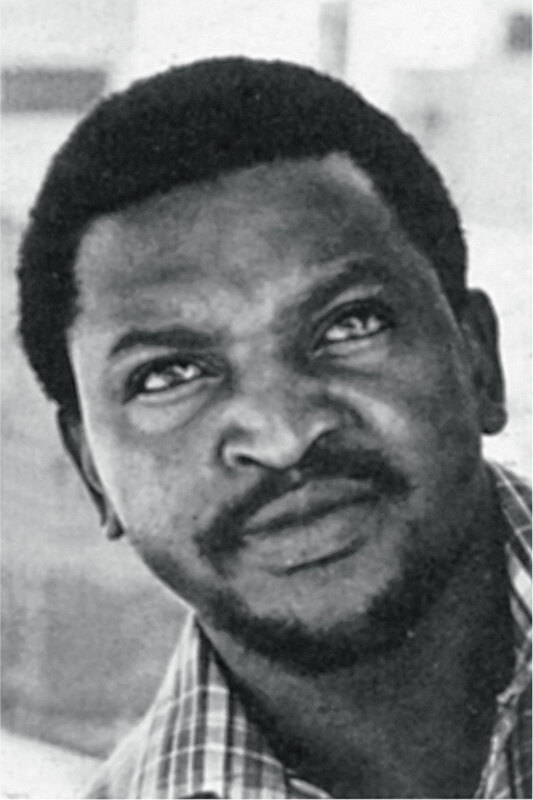 Photograph of Judus Mahlangu. Source: Ricky Burnett (ed.). 1985. Tributaries: A view of Contemporary South African Art. BMW Communication Department, SA. p. 58. Buyani Bazaar (plate 36) is another highly-animated etching by Mahlangu in which he uses his inventive and wide range of techniques to rich effect. Crowded with many human figures, it may be usefully compared to his etchings of a similar scale and spirit, such as his Baptism (1975) (A/P2) in the University of Fort Hare Collection.1 Buyani bazaar might seem an unusually secular image, given Mahlangu’s frequent use of Christian religious themes, but he was equally dedicated to representing scenes from daily life. This crowded and vital scene of a busy market place is bisected and almost dominated by a tall, bare-breasted woman. She stands awkwardly, carrying a large container on her head which she supports with both of her hands. In the bottom right-hand corner of the print is an onlooker to this scene who sits with his clasped hands resting on a table. Another bare-breasted woman is in evidence to the right. The facial expressions of a number of the figures, including the centrally-positioned woman, have wide-open eyes, as if they are surprised at what they see going on around them. A subtle hint of the comic infuses this bustling scene, which is in keeping with much of Mahlangu’s other work at this time. Buyani bazaar is also to be found in the University of South Africa (UNISA) Art Collection in Pretoria (Acc.no. P120). 1. See E.J. De Jager. 1992. Images of Man. University of Fort Hare Press. Alice. plate 86, p.81.